28 & 52 x 48", 750 hp engine @ 82 rpm; Built King Iron Works, Buffalo (1889). Scotch boilers 12 x 11' 6", 165#. Double bottom ballast tanks; 3 bulkheads. 1889, Apr 23 Launched; Cost $160,000; 3 bulkheads, double-bottom ballast tanks. 1890 Operated by Lackawanna Line; carrying record grain cargos. 1894, Aug Collided with schooner AHIRA COBB, Mud Lake; upbound with coal in heavy fog. 1895, Oct 18 Owned Kelderhouse et al, Buffalo; sunk in collison with WM. H. GILBERT, near Sault Ste. Marie; raised. 1899 Owned G.W. Maythem et al, Republic Steamship Co., Buffalo. 1902 Owned Charles Beyschlag, St. Clair, MI. 1905, Jun 5 Owned Wisconsin Transportation Co., affiliate of C. Reiss Coal Co., Sheboygan, WI. 1912 Transferred to North American Steamship Co., also affiliate of Reiss. 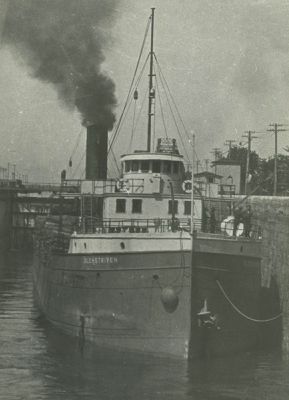 1916 Owned Lake Transportation Co., Buffalo. 1919 Great Lakes Transportation Co. Ltd, James Playfair, Midland, ONT (C138218); Renamed GLENSTRIVEN; 274.7 X 42.2 X 20.5; 2152 gross/1585 net tons; used in grain trade. c1919 Bridge structure rebuilt; wood masts replaced with steel pipe spars. 1923, Nov 16 Wrecked at South West Shoeal off Cove Island, 5 miles west of Tobermory; 160,000 bushels oats. 1923, Dec 5 Refloated by Reid Wrecking Co., Sarnia, taken to Tobermory for temporary repairs, to Collingwood for drydock & inspection.